When your destination is adventure, get there with the confidence only a Triton Trailer provides. For more than 40 years, Triton Trailers has manufactured aluminum trailers with a sharply honed focus on quality and innovation. Triton Trailers makes utility, sport, enclosed, and cargo trailers that fit your work-hard-play-hard needs. 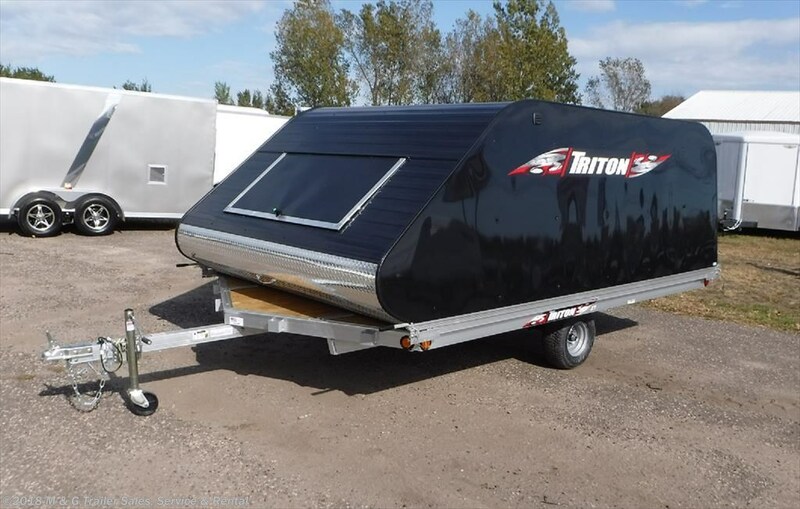 Shop Triton for snowmobile trailers, enclosed trailers, ATV and UTV trailers, watercraft, motorcycle, and utility trailers. 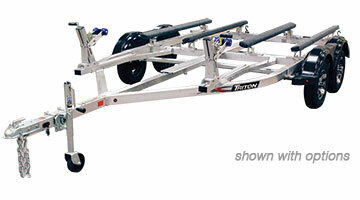 Open Triton snowmobile trailers are made with a corrosion resistant all-aluminum lightweight body that features superior welds for added strength. From XT entry level trailers to premium Elite trailers, expect quality and performance. With several model options at every price tier, there’s an open Triton snowmobile trailer to fit your budget and towing needs, whether you’re hauling one sled or six. Upgrade your Triton open snowmobile trailer with an all-aluminum constructed Triton Coverall cover. Designed for 10, 11 and 12-foot Triton open trailers, the unibody frame and custom engineering result in a cover that provides the most interior space possible while maintaining aerodynamic design and ease of towing. Travel securely with a Triton fully enclosed snowmobile trailer from the economical standard V-nose cargo trailer to the premium Lowboy line of enclosed trailers with features like two full-length quickslides and a dropped rear beavertail. 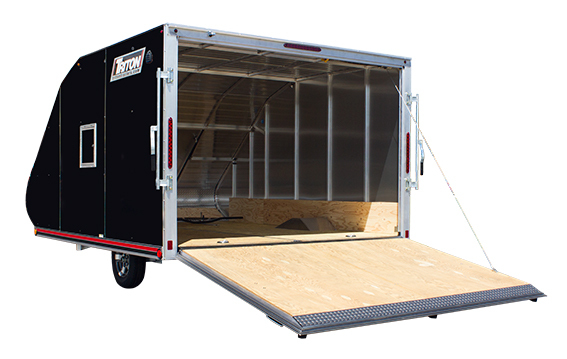 Triton enclosed trailers are available with spring assisted lift rear doors, side doors and single or tandem torsion axles. 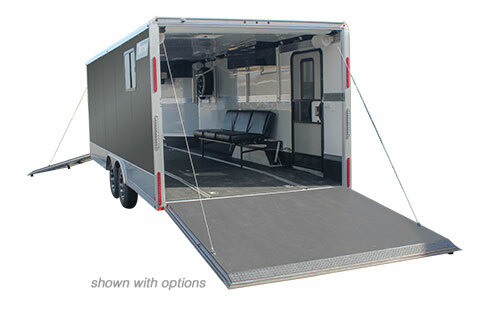 With many additional options at every price level, a Triton enclosed trailer can be customized for your needs. 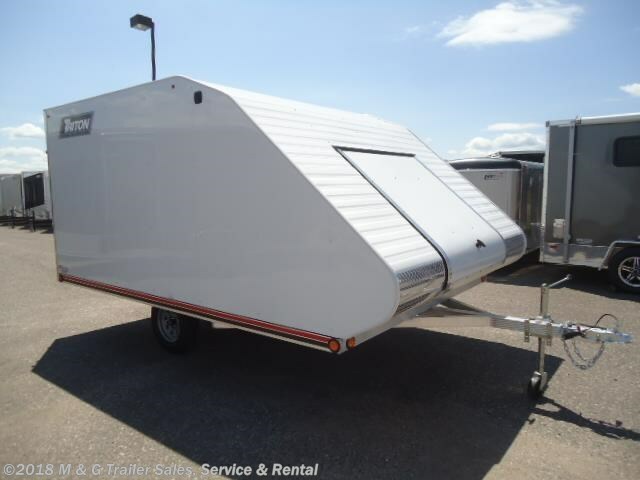 Reap the benefits of an enclosed trailer and the protection of a coverall with a hybrid snowmobile trailer. Lightweight and aerodynamic Triton TC model hybrid trailers feature all-aluminum, full-tubular frame with a rear drop down ramp and torsion axles. Hit the road to adventure with a Triton ATV or UTV trailer. For work or play there’s a Triton trailer configured for your budget and needs, from aluminum and wood deck value models to all aluminum enclosed models for the ultimate in security and quality. Entry level models offer strength and durability with a stout aluminum frame topped by marine grade half-inch marine plywood backed by a lifetime warranty. Take your towing up a notch with the Triton Value level GU trailers, designed to provide worry-free towing for your UTV and ATV. 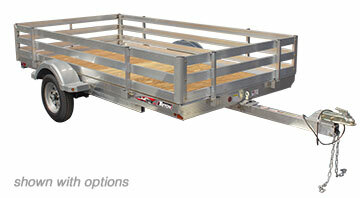 Value trailers also feature four tie down positions and tilt beds for secure towing and easy loading. Lightweight and heavy-duty the Triton line of all-aluminum ATV and UTV trailers are built with full-length channels and a line of accessories to make towing safe and secure. From entry level tilt trailers to premium specialty trailers, there’s a model in the vast, customizable line to fit your adventure and work needs. Enclosed ATV and UTV trailers offer the ultimate in security for your ATVs and UTVs. 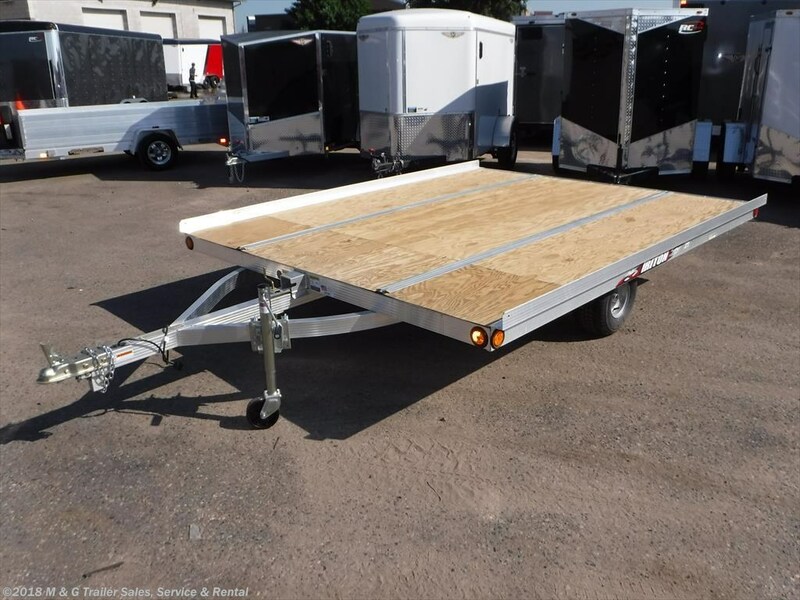 From standard enclosed trailers to premium plus enclosed trailers there’s a model for every budget and need. From value to top-of-the line, enclosed Triton ATV and UTV trailers offer ease of loading and unloading with spring assist lift rear doors and a long list of included premium features. When the long and winding road calls, haul your motorcycle with confidence on a Triton trailer. Open, enclosed, or hybrid, Triton’s line of motorcycle trailers has something for everyone from the first-time motorcyclists to the veteran bikers. For the long haul, consider an enclosed trailer that offers the ultimate in protection and security. 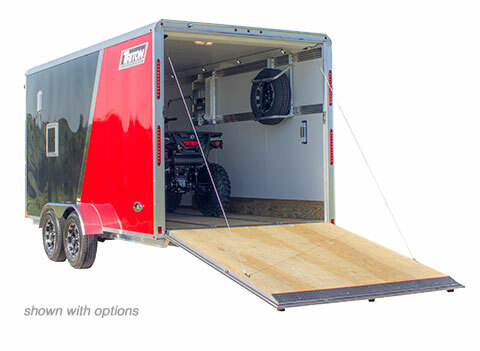 Premium plus trailers offer room for your bike as well as tools, parts and helmets. 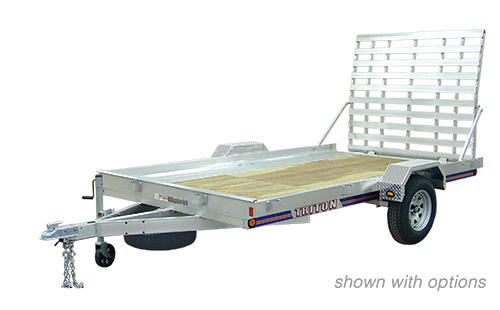 From personal watercraft to pontoons, look to Triton Trailers for the perfect trailer. Triton, which got it start in the marine sport industry, can be depended on to offer the best in aluminum water craft trailers to get you on the water in style. From kayaks to pontoons, Triton manufacturers a trailer designed to get you on the water and into fun. Founded more than 40 years ago, Triton Trailers is one of the oldest aluminum trailer manufacturers in the USA but manages to keep its focus forward to maintain its reputation as one of the most innovative companies in the industry. From its headquarters in Hartford, Wisc., Triton keeps a sharp focus on quality, innovation, safety and exceptional customer service. Triton got its start in 1975 as manufacturers of boatlifts. Founders John Reiser and Bob Peisch moved the company from a garage to a plant in Allenton, Wisconsin in 1976. By 1995, Triton had outgrown its facility, moving to a 190,000-square-foot building in Hartford, Wisconsin. Triton was purchased in 2013 Jacsten Holdings. Today innovative and dependable Triton trailers can be found throughout the U.S. Canada, Mexico, and select international markets. To find a new or used Triton Trailer to fit your needs, visit the Triton experts at M&G Trailers in Ramsey, Minn, where a large inventory of Triton trailers are available today.